Beneath the Orgoth and Morrdhic ruins that stud the landscapes of Immoren lie countless hidden halls and tunnels holding unknown treasures and powerful weapons. In these dark place the stealthy footfalls of sightless beasts echo in the distance, unseen wings flutter close by, and foul water drips endlessly from age-old stalactites. For those who dare to enter these catacombs, visions of imminent riches must be balanced against myriad hazards and subterranean horrors. For the first time, Iron Kingdoms campaigns can delve into this deep and mysterious realm. 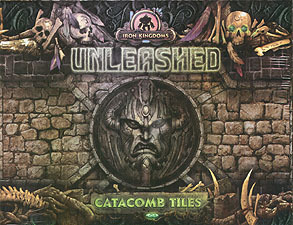 The Iron Kingdoms Unleashed Catacomb Tiles kit features nine 8.5" x 11" double-sided tiles, offering nearly endless combinations of passages and caverns for characters to discover. With this kit you can expand your Iron Kingdoms Full Metal Fantasy Roleplaying Game and Iron Kingdoms Unleashed Roleplaying Game adventures into the forbidding underground terrain of Immoren. Once there, even the bravest explorers will find ample reason to be scared of the dark.